Crude oil prices fell around 3% during yesterday's session on fears of supply growth and a global economic slowdown. In addition to that, the increased uncertainty over the US-China trade talks, also kept the markets unnerved weighing negatively on the black gold. However, prices managed to recover from their lows amid broad US Dollar weakness. Attention now turns towards the US API crude stockpiles data due later today for fresh insights on the US supply-side scenario, which will have a significant impact on the US oil. 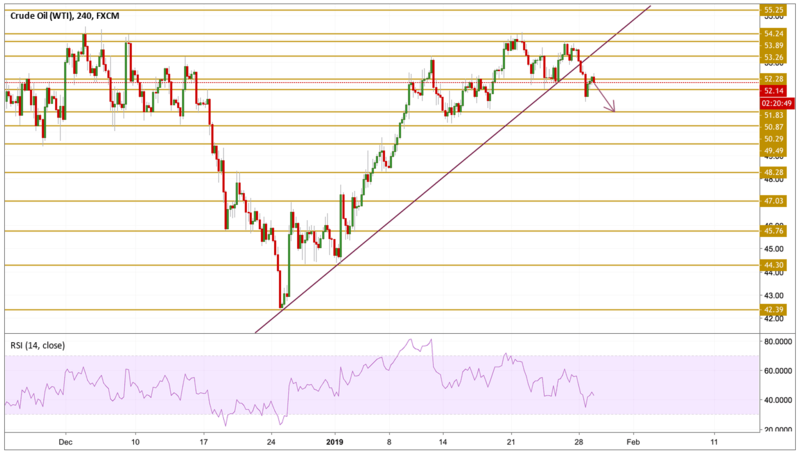 As expected, Crude prices broke below the purple trend line presented on the chart and extended their downward move to reach $51.31 per barrel. The price is currently hovering just below the $52.28 resistance level after a recovery but the bearish move is more likely to continue and we will be focusing on the $50.87 support level.